Let me start off by saying that some of this post will be duplicated from a post over on the Google+ Fate Community but I felt like it was a good idea to post it here as well. I have decided to run a few games go Fate in the coming weeks at my local FLGS both to introduce new players to the system and to flex my Fate muscles. My current plan is to run a different setting every other week to help illustrate how versatile Fate really is. Currently my plans are to run fantasy (likely something generic and not related to the fantasy setting I mentioned last post), sic-fi (either Star Wars or Star Trek), pulp heroes, and kids vs fairy tales. My plan for the first session is the kids vs fairy tales setting because I am going to start with fewer aspects, use a smaller skill pyramid with an apex skill of +3, and subject matter is friendly and well known to all ages. Before I go any further, I do feel the need to say that this setting and much of the hack is HEAVILY inspired by the Grimm RPG by Fantasy Flight Games. No, they’re not the first people to make a game like this, but they did a HELL of a job and it’s going to make developing my own setting much easier. The book is no longer in print but I really recommend grabbing the PDF...totally worth it. I am still looking for the right equivalents for Empathy, Investigation, and Rapport. I’ve had some good suggestions over on the G+ community, but I haven’t settled on anything just yet. Imagination is a new skill that will essentially be the "magic" the kids of access to and mostly be used to overcome and create advantages, though will proper stunt choices could be used for other actions as well. The plan is to use partially complete character sheets and let the player fill in some skills, a aspect, and a stunt to make them their own and show how cool the character creation process is in Fate. So, that’s where I am at with it for now. I have a few weeks before I have to run anything, so there’s LOTS of time to plan and work this out. Comments and suggestions are welcome. I do have to say that I am more exited to run this series of games in Fate in than I have been for a while. This is something I've looked at for a Grimm or Dresden type of game in Savage Worlds. I've also been working on an alternate history of Boys Town here in Omaha, "He Ain't Heavy, He's Rindin' Shotgun," in which Father Flannigan runs a grittier, Hogwarts-esque orphanage set up to train students to use whatever talents they have to hunt monsters. All this was in secret until 9-11, then some other things happened I can tell you about if you're interested. At any rate, all this is no longer secret, and pretty much everyone is packing. 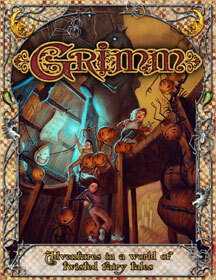 Oh, yes, I like Grimm, too! Well, I picked up a digital copy of Marchland on your recommendation. I have only flipped through it at this point, but it is most definitely mineable for idea. Thanks for the heads up!